With GluonCV, we have already provided built-in support for widely used public datasets with zero effort, e.g. Prepare PASCAL VOC datasets and Prepare COCO datasets. However it is very natural to create a custom dataset of your choice for object detection tasks. This tutorial is intend to provide you some hints to clear the path for you. In practice, feel free to choose whatever method that fits for your use case best. Let us walk through some fundamental backgrounds in case you are not familiar with them. 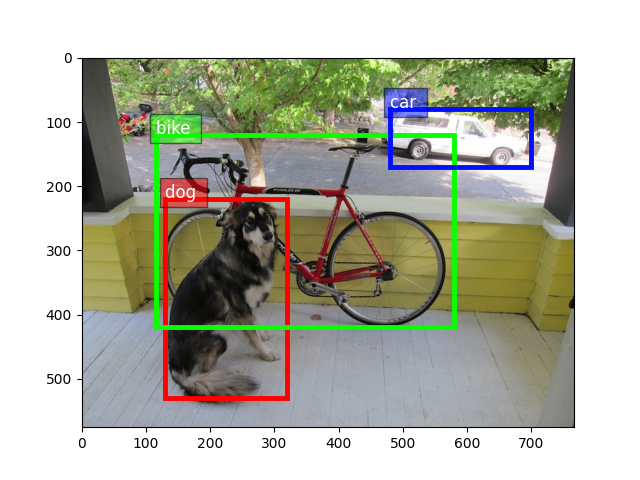 There are multiple ways to organize the label format for object detection task. We will briefly introduce the most widely used: bounding box. GluonCV expect all bounding boxes to be encoded as (xmin, ymin, xmax, ymax), aka (left, top, right, bottom) borders of each object of interest. Now, let’s label the image manually for demo. In practice, a dedicated GUI labeling tool is more convenient. Following the convention used in MXNet, we recommend a LST file which is a plain text list file to store labels. LST file was first introduced in MXNet following the RecordIO design and the List file tutorial of creating a LST file. It’s easier to manege single file rather than scattered annotation files. It’s compatible with RecordFile binary format which we will cover in this tutorial later. Typically, we take the list of names of all images, shuffles them, then separates them into two lists: a training filename list and a testing filename list. Here we use compatible format for object detection task as mxnet.image.ImageDetIter. mxnet.image.ImageDetIter is a object detection data iterator written in C++ which includes tons of augmentation choices. However, it’s not flexible enough to handle all kinds of customized data augmentation. As a result, in GluonCV, we switched to gluoncv.data.transforms to support almost all types of data augmentations. A single line may be long, but contains complete information of each image required by object detection. The length of each line varies, depending on how many objects are labeled inside the corresponding image. By stacking lines one by one, it is very nature to create train.lst and val.lst for training/validation purposes. In this tutorial, we repeat the same image 4 times to create a fake val.lst file. Reading scattered images in folders can be slow, due to constraint of disk random access speed. There’s a significant gap between random/sequential access speed especially on HDDs. Even with modern PCI-E based Solid State Drives, sequential reading IO performance still blows random reading by a large margin. We will skip repeating the design of RecordIO built into MXNet, if you are interested, have a look at RecordIO design. In this section, we go through the fundamental steps to create a record file. First of all, you will need a im2rec.py file to start with. You can find im2rec.py in incubator-mxnet/tools/, or you can simply download it now. --pass-through: no transcode of original image, pack it to binary as is. It will preserve original quality and aspect ratio anyway. --pack-label: pack the labels in lst file to binary record file, so .rec file is self compelete. It you have a custom dataset fully comply with the Pascal VOC object detection format, that could be good news, because it’s can be adapted to GluonCV format real quick.